Tish makes an impuse decision to leave her home in Michigan and buy the old McComb house in Noble, Alabama, the house the original Leticia McComb lived in with her husband in the 1870’s. But she hasn’t bargained on being the town pariah the minute she arrives—it seems that her father’s telling of the family history has missed a few things out. And things get more difficult when she takes in the homeless Mel Hamilton, the town bad girl who has been kicked out by her parents. Tish soon meets George Zorbas, owner of the town antique store and a dog who believes she still lives at the McComb house. There is a romance, but it’s slow and not the main focus of the story, which is the relationship between Tish and Meg, who both felt ostracised and alone in their growing-up years and are both now struggling to be accepted in a town that doesn’t want them (it seems that the idea of the ‘welcoming South’ only goes so far). 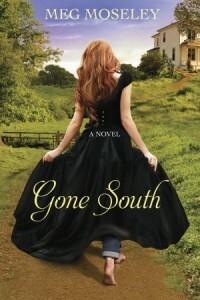 While Gone South is published by WaterBrook Multnomah, a Christian publisher, the story isn’t outwardly Christian. Meg and Tish pray occasionally, neither go to church (and the churchgoing townspeople could do with learning a little about the concept of Christian forgiveness). I usually like my Christian fiction to be a little more Christian, but this worked for me. I liked the fact that the characters were real people with faults and worries (including financial worries). I liked the fact that the romance took a back seat to the other relationships: Tish and Meg, Meg and George, George and Stu. I especially liked the fact that although Gone South wasn’t overtly Christian, the underlying prodigal son theme was definitely Christian. Recommended. 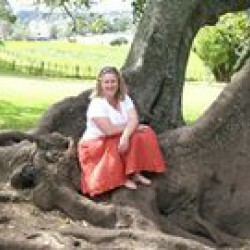 Thanks to the WaterBrook Multnomah and Blogging for Books for providing a free ebook for review.